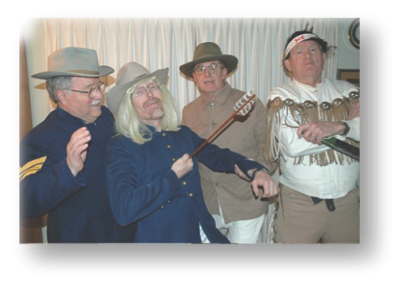 The Doodle Dandies Quartet feature harmony and humor in fun packages of song from several musical eras. We've sung for everything from ladies aid groups to donkey basketball games, but mostly for conventions and barbershop shows around the Northern Rockies." The Doodle Dandies formed initially to be an integral part of the Montana Centennial Barbershop Chorus that toured Montana in 1989 and again with the Millenium Chorus in 2000 with performances in Austria, Germany, Belgium, and France. The Doodle Dandies are an accountant, professional pilot, college professor, and research scientist—you figure out which is which. But they share one thing in common—they love to sing and entertain and have fun with their wide variety of audiences. The Doodle Dandies are strong supporters of youth music programs locally and statewide. Please contact us (406-548-1391) if you would like to Chord Rustlers to sing at your next special event or if you are interested in joining us!